Tours and Facility Rentals - Mari-Mann Herb Co., Inc. Tours and Facility Rentals - Mari-Mann Herb Co., Inc. Please Note – Children under 10 are ½ price and infants are free. Please contact us for more info. General time is from 11am – 1pm / Monday – Saturday. Program lasts approx. 40 min / lunch 1 hr / shopping 1 hr. Weather permitting, the program will start in the Pavilion and continue into the Garden, otherwise all inside Sugar Plum House. 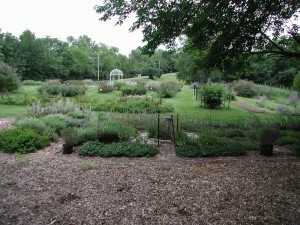 Programs are given year round and Mari-Mann™ always has an ample supply of herbs and education. During the program a sampling of our “Famous” Lavender Lemonade will be served. At the end of the luncheon a 10min Mari-Mann video with Maribeth is shown. You are then free to revisit the garden, enjoy our gift shop and/or have a meeting. Entrée: Our famous Herbal Crepe Sandwich – Twelve layers of “healthy goodies” divided by our specialty “iced” homemade crepes. Made with milk, flour, eggs and our Mari-Herb™ Dip Seasoning Mix. Each layer is filled with veggies such as carrots, tomatoes, spinach, cucumbers, sweet bell peppers, etc. Other layers are covered with thinly sliced ham, smoked turkey, egg salad, and healthy unprocessed natural cheeses. Finally, the sandwich is “iced” with a layer of cream cheese mixed with our Mari-Herb™ Mix and topped off with edible flowers and decorative herbs. Fruit Salad or Fresh Fruit(when in season) baked with Mari-Mann™ Cranberry Tangerine Chutney. To Drink – Our House favorite Blend Berry Berry™ Tea and/or Mari-Mann™ spring water fresh from our spring. All iced unless otherwise requested. We are very accommodating for your private use of our facilities. If you need to have a meeting or “get together” combined with our luncheon and program, please let us know. When requested, you may vary the time and days including evenings and weekends. Burnet – Often called Salad Burnet as it has a lovely cucumber taste and is extremely popular as a salad herb and garnish. Johnny Jump Ups – Also known as heartsease. This pretty little flower comes under Culpepper’s “Doctrine of Signatures” as it is heart-shaped. Historically, it was munched upon to strengthen the heart. Chive Blossoms – These are beginning to be quite in vogue for all type of cooking (salads, soups, meats and vegetable dishes), as they are quite decorative. Remember they have a fairly strong onion flavor, so it’s best to break them in small pieces and sprinkle over your food as you do with salt and pepper. Rose – Yes, the blossom of the rose is edible. Go easy as with the chive blossoms. Imbibes a light almost vanilla like quality to gourmet dishes. Sweet Woodruff Blossoms – These tiny white blossoms are usually found garnishing “May WINE” and impart a herbal flavor with green notes that are refreshing and pleasant. These blossoms have a distinct German credential. It is part of the tradition of the maypole, an annual ritual that brought together the unmarried women and men of a village. Both the flowers on the maypole and the fresh herbs in the wine honored youth and springtime. Calendula – A Chef’s favorite and often called the “Poor Man’s” saffron. It imparts a beautiful gold color and somewhat “saffron like” flavor to rice, sauces etc. The Calendula flower is also made into a cream or ointment. It is often used as a homeopathic treatment for abrasions, cuts, scratches, rashes, and dry skin also as a wonderful night cream for wrinkles. It also has several carotenoids including lutein and zeaxanthin, which are great for eye health. PLEASE NOTE – Every Crepe Sandwich is a work of art. The edible garnishments will vary according to season and availability.